I love lasagna. Got a little Garfield in me for sure. I also love to experiment with lasagna. Greek Lasagna with Feta and Chicken Lasagna Wheels are a few favorites. It was just a matter of time until Mexican Lasagna was on the menu. Me gusto este lasaña mucho. 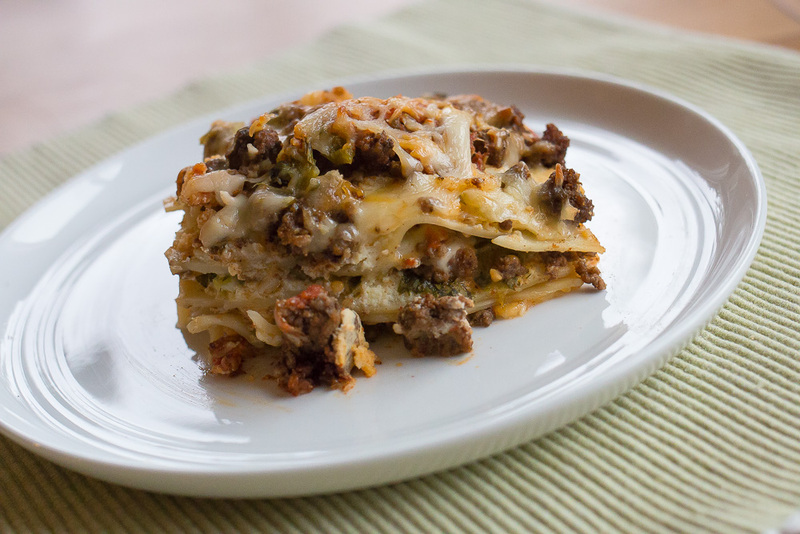 I’ve tried some Mexican-inspired lasagnas in the past. Never impressed. Can’t understand recipes that use “chunky” salsa and others that use tortillas instead of noodles. It’s la-sag-na people. That’s a noooodle. This Mexican Lasagna has all the pop and flavor I love in my Mexican food. Cilantro and green chiles and green onions and good salsa…yes, please. 1. Use your favorite salsa. If it’s chunky, give it a trip through the blender. I use my homemade freezer salsa. I totally love Emerald Valley though if you need a fresh but not-made-by-you salsa. 2. Shred your own cheese. Those pre-shredded packages are good in a pinch, but the fillers make it dryer and less melty. Optional toppings: sour cream, more green onions, diced tomatoes, chopped avocado and pickled jalapeños. Step 2: Brown ground beef in a large, deep skillet over medium-high heat until no pink remains. Drain grease. Turn heat to low and season with chili powder, cumin, garlic powder, salt and pepper. Stir to throughly coat meat with seasonings. Turn off heat and set aside to cool. Step 3: In a small bowl, whisk egg and stir in ricotta. Step 4: In a 9×13 baking dish, spread 4 overlapping lasagna noodles to cover the bottom of the dish. Step 5: Spread ⅓ of the ricotta mixture over the noodles. Sprinkle ⅓ of the beef mixture over the ricotta. Spoon ⅓ of the salsa over the beef. Sprinkle ⅓ of the green onions, green chiles and cilantro over the salsa. Top all with ⅓ of each of the cheeses. Step 6: Repeat noodle through cheese layers 2 more times. Step 7: Bake lasagna on the middle rack for 35-40 minutes or until the it is heated through and cheese is bubbly. Let the lasagna cool for 10 minutes on a wire rack before cutting. Step 8: Serve lasagna squares with optional sour cream, sliced green onions, jalapeños, more salsa and avocado.